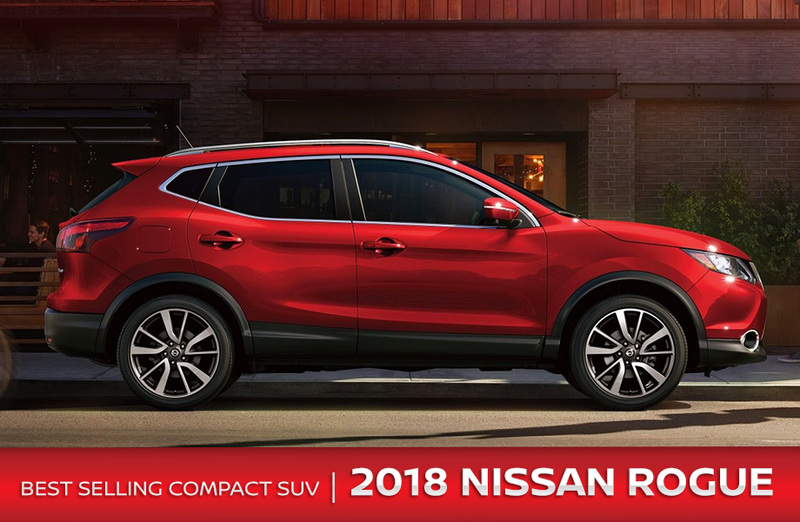 If you’re looking for a feature-rich compact SUV, then look no further than the 2018 Nissan Rogue at Rountree Moore Nissan. Well-equipped with the features you need in your daily drive, the Rogue is an excellent choice. The Nissan Rogue comes in 3 different trims: S, SV and SL. The SV also comes in Midnight Edition with black exterior accents, roof rails and cross bars. The Rogue also has the available ProPILOT system that adds more security to your driving experience. Test-drive the 2018 Nissan Rogue at Rountree Moore today. The 2018 Nissan Rogue seats 5 passengers comfortably on its standard cloth upholstery. Seating becomes even better when fitted with optional leather upholstery, power-adjustable seating and heated front seats. The rest of the cabin features premium materials, giving the interior a contemporary feel. The new Rogue also offers 39.3 cubic feet behind the rear seats and 70 cubic feet of cargo room with the rear seats folded down. This outclasses the Kia Sportage, which offers just 31 and 60 cubic feet of cargo room, respectively. Standard features on the Nissan Rogue include Apple CarPlay™ and Android Auto™, which are a pair features you won’t find in any trim of the 2018 Mazda CX-3. The Nissan Rogue also includes optional features such as a Bose® premium audio system. Get a taste of the 2018 Nissan Rogue by visiting Rountree Moore Nissan for a test drive today. The 2018 Nissan Rogue comes with a 170-horsepower 2.5L 4-cylinder engine that’s paired with a continuously variable automatic transmission. The Rogue’s engine pushes out more power than the 2018 Mitsubishi Eclipse Cross’s 152-horsepower engine. Fuel efficiency is a strength of the Nissan Rogue, with its EPA estimates coming out to 26 MPG city and 33 MPG highway. For comparison, the 2018 Ford Escape gets an EPA-estimated 21 MPG city and 29 MPG highway. Feel the performance at Rountree Moore Nissan when you test-drive the new 2018 Nissan Rogue today. Named a Top Safety Pick by the IIHS, the 2018 Nissan Rogue is ready for any emergency situation. It even received the highest mark of Superior due to its front crash prevention technologies. Additionally, optional safety features include Lane Departure Warning, Lane Keep Assist, Pedestrian Detection, a Surround-View Camera and more. Find out why drivers in Lake City, Jacksonville and Gainesville, FL are lining up to put their confidence in the 2018 Nissan Rogue. Test-drive one at Rountree Moore Nissan today.